The electro-house producer - whose real name is Joel Zimmerman - confirmed that he is in a state of romantic bliss with tattoo artist Kat Von D (Katherine von Drachenberg) at a secret gig in Los Angeles, reported Billboard. The couple, who have been dating for several months, revealed their relationship in September. Kat, who previously had a high-profile relationship with Sandra Bullock's ex-husband Jesse James, wrote: "I got a good feeling about this one..."
Deadmau5 also said that he plans more collaborations in the future, with different artists. He has already worked with Pendulum's Rob Swire, Skillrex, Ryan Adams, My Chemical Romance's Gerard Way, Cypress Hill and Imogen Heap, but wants to do more. "I didn't want to be that Ghost & Stuff guy any more. I like to keep things fresh and new all the time instead of being that guy associated with this other person for life," he said. 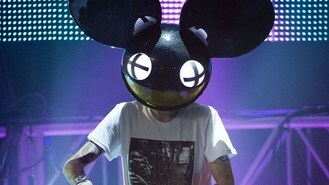 The 31-year-old played a 90-minute set with "a mini version of his touring set up" - LED screens, lights, and an array of creative visuals such as old school "Deadmau5 Nintendo", as he was watched by industry guests and die-hard fans.